Barcelona’s Javier Mascherano wants to return to River Plate before his playing days are over but is wary of making a promise he cannot keep. Mascherano has already said he will retire from international football with Argentina after next year’s World Cup and, after two summers of uncertainty, he may finally decide to leave Barcelona at the end of the current campaign, too, despite having a contract at the Camp Nou until 2019. The 33-year-old began his career with River, before moving to Corinthians, West Ham, Liverpool and Barca, and says he still has unfinished business with the Buenos Aires club. “I still feel there’s a chapter in my career to be dedicated to River,” the Argentina international told TNT Sports ahead of Saturday’s friendly against Russia. “The problem is, speaking about River, I don’t want to be a prisoner of my own words. I don’t want to be saying I’ll be back in December or June and then if it doesn’t happen, what do I do? Was I lying? 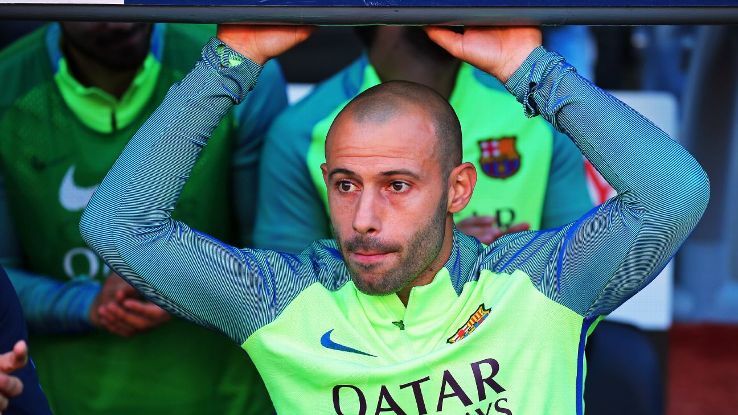 Mascherano told ESPN FC in the summer that he is also considering playing in Major League Soccer, while he should not be short of offers to continue in Europe, either, if he does leave Barcelona next year. Javier Mascherano began his career with River Plate. However, whatever move he decides to make, Mascherano is adamant that it will not be influenced by money. That said, it is unlikely Mascherano will leave Barca halfway through the season having re-emerged as a key player under Ernesto Valverde, starting four of the last six La Liga matches as the Catalan side have chalked up a 16-game unbeaten run. Despite that unbeaten streak, Valverde’s side have still been criticised for their performances, and midfielder Sergio Busquets says they have not been at their attacking best this season. “We’re on a really good run,” Busquets told Radio Marca. “We’re not playing brilliantly, but we’re solid and compact. It’s difficult to score against us and we’re really happy.